Saturdays & Sundays 1-6 pm. Wednesday thru Friday, 1-5 pm. 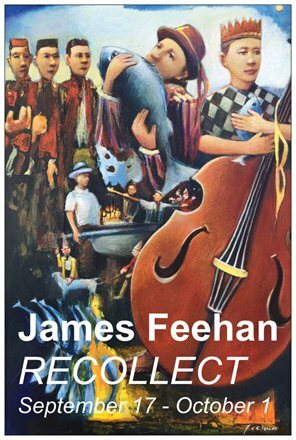 New Hope Arts is pleased to host RECOLLECT, a solo exhibition by James Feehan. 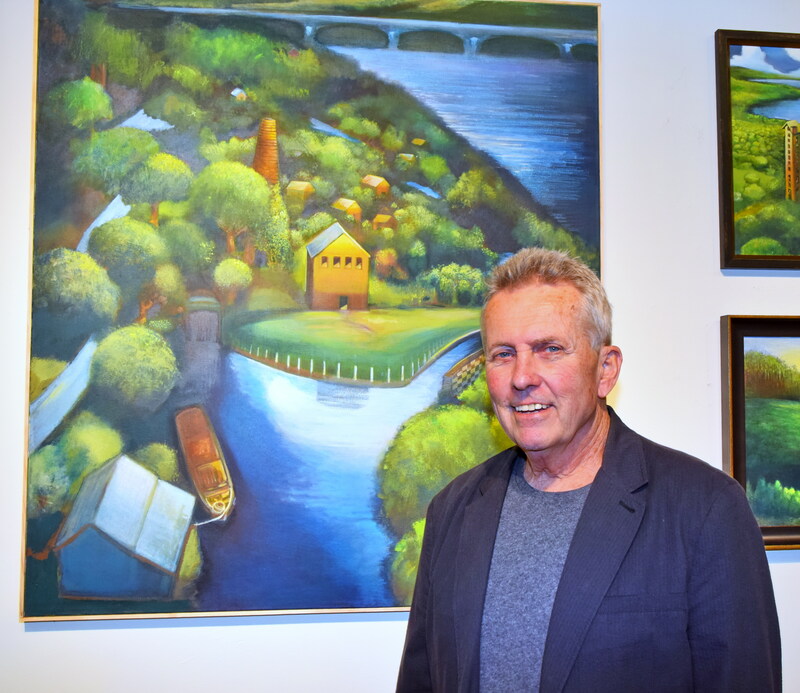 Titled by the artist, “Recollections in Paint - a show of paintings memorials and hymns” works from the present and the past showcase the remarkable imagery of this regional artist, who has been educator and icon to many students over his 40 years in Bucks County. 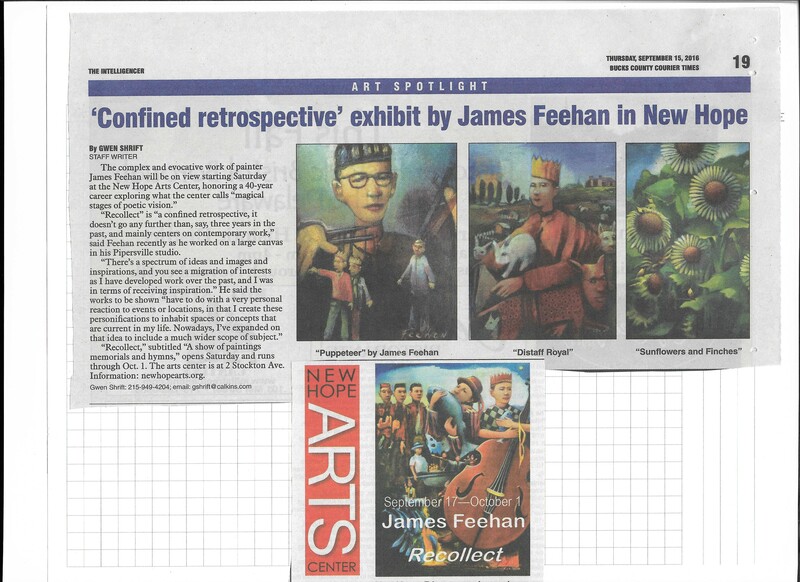 The exhibition, over a year in planning, is a rare opportunity to view the wide variety of subjects Feehan embraces. “Images range in subject to include landscapes mostly dreamed. Portraits are conjured from my imagination.- images of unusual subjects reflecting on local stories mysteries and provocations. I believe that the mix of paintings all involve an influence that is based on my privilege of surroundings and indebtedness to the same,” notes the artist. James Feehan expresses his gratefulness to the community that has supported him and stamped his development over the years. There is much to glean from this homage to our region and its richness of its visual splendor. The artist will be present for the opening reception on Saturday, September 17 from 6-8 pm. The exhibition is free and open to the public. Extended gallery hours are offered during this exhibition through Saturday October 1.. The paintings exhibited under the title recollect include work primarily from the last year. Images range in subject to include landscapes mostly dreamed. Portraits that are conjured from my imagination. images of unusual subjects reflecting on local stories mysteries and provocations. I believe that the mix of paintings all involve an influence that is based on my privilege of surroundings and indebtedness to the same. Like many hereabouts I arrived looking for my creative self and found in this place many on a similar course. Friends made here supported or at least tolerated such indulgence. Many more assisted by default to the artistic heritage steeped in the area. One could recognize this stamp on my development. I find my work in debted to the community and its welcome .